Mint House Summer Social: Restorative Strawberries! Join us for an informal Mint House summer social. 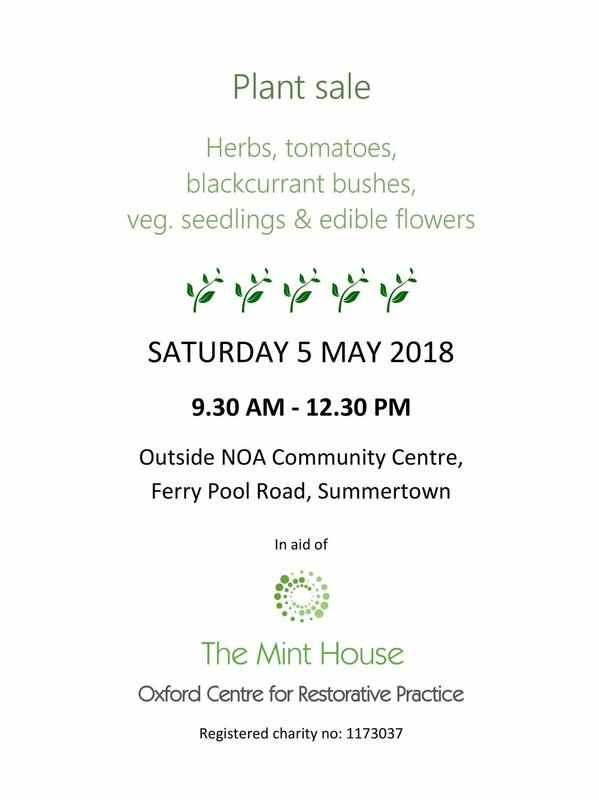 Come along for scones and strawberries, and a catch-up on the latest restorative happenings in Oxford. 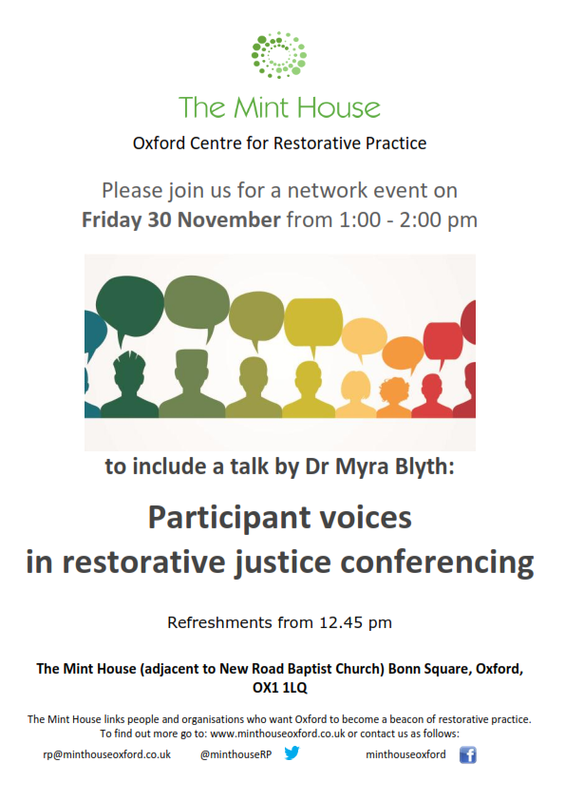 Lorna Cousins will tell us about her work to develop restorative approaches in communities. Lorna has been using restorative practices in a variety of settings since being trained in 2002, including as a Restorative Justice Facilitator in youth justice and Family Group Conferencing facilitator in Social Services. She has also been an RSQM assessor for the Restorative Justice Council and is now with Restorative Solutions, managing restorative services; using restorative values to underpin leadership. Lorna has also spent time embedding Restorative Practice into a London neighbourhood and community. This was a rich and rewarding experience that taught the knowledge, understanding and value of the wider restorative framework. Can we make Prisons more Restorative? Geoff Emerson explores the issues and describes an initiative at HM Prison Bullingdon which is seeking to use RJ as part of the adjudication (internal discipline) process. Can Restorative Justice reduce violence and give prisoners the skills to prevent conflicts from escalating? Come and find out. 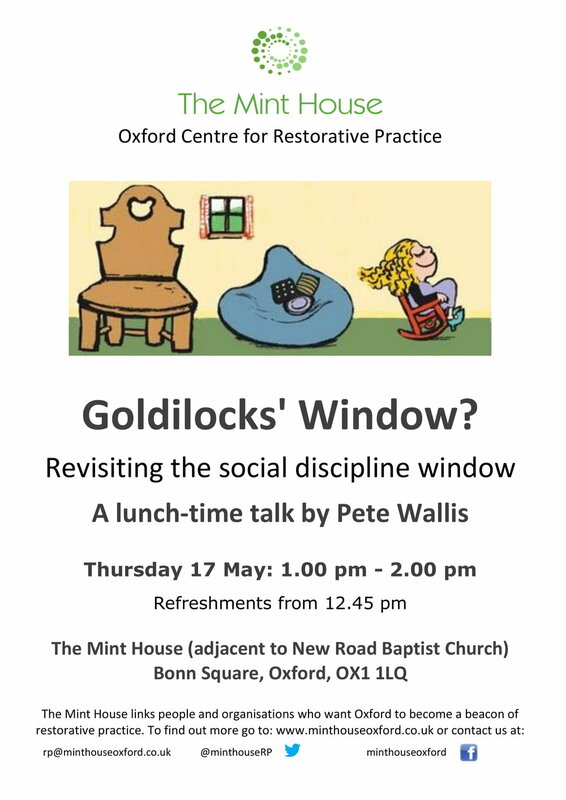 Geoff worked in Probation for many years and introduced restorative justice to enable those who had caused harm, and those who had suffered harm to be able to move forward. 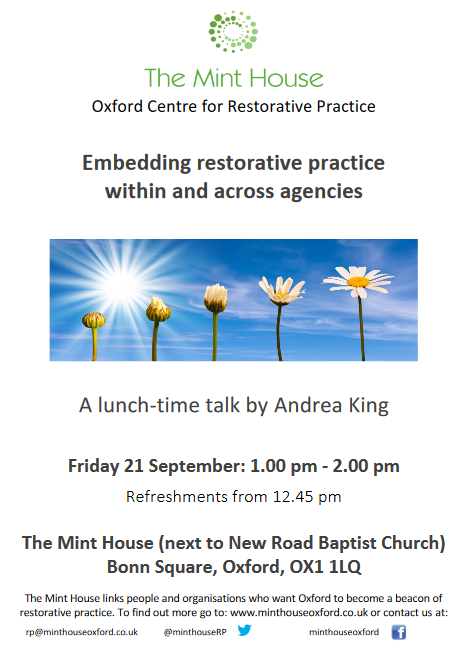 He now works with the Mint House to make restorative justice more available to those who may find it helpful. Dr Belinda Hopkins has been passionate for many years about putting joy, curiosity and wonder back into learning. When teachers are overwhelmed by the challenges of ‘managing’ classrooms or policing ‘behaviour’ they lose sight of why they came into teaching in the first place. Sometimes every lesson becomes a battle of wills. Restorative and relational ways of thinking, speaking and behaving can bring fresh energy back to the shared endeavour of learning about life, in all its wondrous facets. Following the success of our last human library, we've decided to host another. The Human Library is an international movement that promotes an inclusive way to challenge prejudice through social contact. Just like in a real library, a visitor to the Human Library can choose a Book from a range of titles. The difference is that Books are people, and reading is a conversation. These events give you permission to delve straight into a conversation with someone you wouldn't perhaps otherwise cross paths with. This event aligns perfectly with what we're always trying to do at The Mint House, which is to create dialogues in order to see the story from both sides. This creates a new understanding and challenges our original opinions and beliefs, often shaping change and personal growth. How can Universities be restorative? I never tire of learning who people are. I believe that everyone teaches you something new each day and that everything is built around relationships. I’ve always believed that relationships are central to everything that we do. Punishment alone just creates resentment, rather than reflection. Conflict and tensions were never dealt with in a way that was meaningful for those at the centre of the conflict and that voice and influence never really truly had the ‘influence’ part. Katherine Stoessel has worked in the field of restorative practice for over 20 years in the UK, the USA, West Africa, the Balkans and Eastern Europe and she is a regular facilitator and trainer for the Thames Valley Restorative Justice Service. She is privileged to work with these powerful and meaningful processes and they underpin her deep commitment to restorative approaches and the profound difference they can make to people's lives. Diana Batchelor began her career in the criminal justice sector with Thames Valley Partnership in 2006, and has since been working in criminal justice and conflict resolution in the UK, South Africa and Lebanon. Her current research is inspired by her experience as a frontline practitioner in the UK: - facilitating restorative justice conferences, supervising young offender reparation, and supporting young victims and families bereaved by homicide. The current research is for a PhD, funded by the Economic and Social Research Council and supervised jointly by the Criminology and Psychology Departments of Oxford University. I conduct interviews with victims before and after they do (or don’t) participate in a restorative justice process. I will present some of my early findings, telling stories and highlighting themes mentioned by more than one participant. I will put this in the context of previous research, which has demonstrated that victims tend to be satisfied with the restorative justice process. What is lacking, however, is psychological empirical research on how and under what conditions restorative justice produces a range of benefits. Moving beyond measures of “satisfaction”, my research explores how benefits for victims are related to their motivation to take part, and to the structure of the restorative process. Our talk will be of a slightly different format this time, in that we're putting together a montage of activities during 2016. This will be followed by an open discussion. There'll also be a raffle, Christmas nibbles and other festive activities to bid farewell to the incredible year we've had at the Mint House. Becci is Assistant Director for RJ at Thames Valley Partnership, a follower of the ‘HOPE not Hate’ Campaign Group and a member of the Oxford Branch of More in Common. She has worked in supported housing, criminal justice and restorative justice, where the common threads of her passion are around creating space for unheard voices, and enabling healthy and inclusive communities. I was a prison governor for 38 years, with the last ten governing Grendon and Springhill prisons. Grendon is a unique therapeutic community prison for people who have committed serious crimes. Springhill is for people coming to the end of long and medium term sentences and preparing for release in open conditions. Both would be considered partially restorative in the model of three circles. supporting the community chaplaincy - New Leaf - mentoring those leaving prisons and returning to the Thames Valley. Victims of serious crime talk about their Restorative Justice experience. ‘My decision to meet the person who harmed me/my mother and how my family reacted’; a conversation with Restorative Justice participants in cases of grave crime, followed by questions and discussion. The human library challenges prejudice and discrimination through dialogue. It uses the language and mechanism of a library to facilitate respectful conversations that can positively change people's attitudes and behaviours towards members of our communities who are at risk of exclusion and marginalisation. Colette Morgan works for SAFE! as the Child on Parent Violence Project Development Manager. Sadly, Child-on-Parent violence is on the rise and this fascinating talk will show us how SAFE! tackles this problem and works with families to cultivate respectful family relationships, for the benefit of all society. We will even provide you with a free sandwich and a cuppa. - Come back later for info on future events.